Hearing the rants of parents and elderly relatives on how the times have drastically changed, seems quite a mundane affair. However, when the girls, whose childhood had been of early 1990s, hue and cry of the ’generation gap’ in the similar manner then that gives me heebie-jeebies. 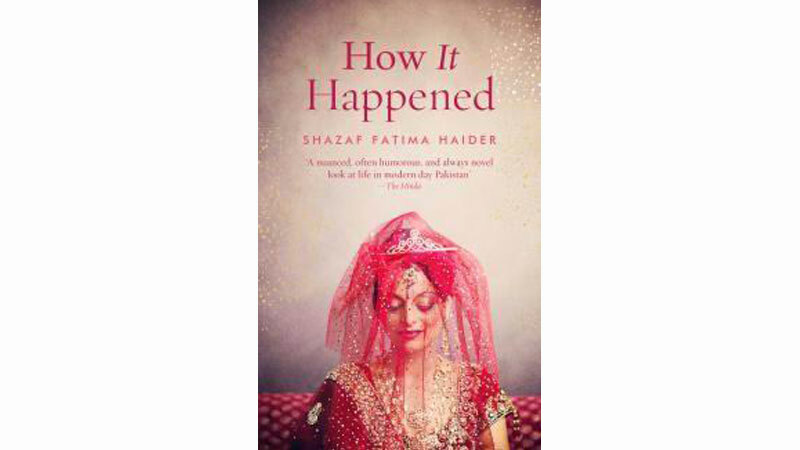 With the ceaseless debate of generation gap, reading Shazaf Fatima’s ‘How it happened’, gave me a feeling of coming back home after a long time, that feeling of being at peace. This is such a capricious piece of writing, filled with everyday family drama and rocky chemistry of relationships. The novel beautifully juxtaposes the antonyms: Shia/Sunni, Love marriage/Arranged marriage, Conservative/Liberal, Old/Modern. The novel revolves around a dramatic family led by a matriarch, Dadi, who since the beginning of the first chapter ensures that the tradition of her Bandian family is executed even in the ‘modern’ times. She is a staunch Shia Dadi, who cannot approve of any Sunni guy or girl for her grandchildren. Also, she strongly prohibits the notion of love marriage for she thinks it is against the conduct of a ‘good respectable eastern girl’. She gets a hard time adjusting with the modernity of the contemporary times, hence gets hysterical palpitation whenever anything is said or done against her will. Her dramatic response full of Haye Haye, amuses the reader when she starts her never ending rant of: Toba Toba, The end of this world is coming! Imam Mehdi come down and save us! The novel is narrated by a young girl who is around sixteen, and fervently tells us the tale of how her sister Zeba and brother Haroon finally got hitched after such melodramatic matrimonial conquests of embarrassment, fight and love. Haider thoughtfully portrays the ‘generation gap’ dwelling amidst three tiers of generations, who are having hard time to adjust (Dadi, Parents and the grandchildren). Dadi belongs to an old school of thought where not getting a proposal was considered the result of evil eye: where arranged marriage was the ‘only’ way to get hooked, that too for the sake of having children: where a girl was suppose to be submissive and of less age, otherwise was considered a woman of bad character because ‘the younger they are, the more malleable’. On the contrary, Zeba belongs to modern times and is a complete opposite of Dadi. She is a girl who is liberal in her thoughts and approach and is doing her undergraduate in literature. Zebs is a constant target of Dadi’s concern because she is over the ideal age of marriage and is 25 now. Her proposed idea, that knowing the suitor before getting married is essential, is a source of abnormal palpitation for Dadi who thinks that they Day of Judgment is now near. The situation just gets worse, by the end of the novel; the staunch Sunni-Shia rift is balanced by Zeba who gets to marry a Sunni pathologist because she falls in ‘love’. To add insult to injury, Dadi’s reaction makes the ending even more interesting. The chapters which amused me the most are Chapter 2 and Chapter 4. Chapter Two: How ‘bandians’ were married, gives a list of narrator’s paternal aunts and uncles followed by a brief description, giving a clear picture of how Dadi failed in making them the ideal Bandian. Hence now tries her best to save the children of her beloved son, Hussain. Chapter four: We searched for girls, mentions 6 proposals of Haroon who were rejected as ‘Dadi’ couldn’t find her perfect ‘Bahu’. Also, the role of drawing room serves to be very significant as it is a trial room in which the serving skills of the candidates are noticed from head to toe. As you turn over the last page of this novel, you think of all the hardships that our elder generations have been through in adjusting with our times and its ways. Maybe they feel like an alien who has lost his way and is getting hard time accommodating to this new place. Instead of criticising them, we can try to find a mid way to balance up the fights and arguments for they have lived half of their life. Instead of teaching them our new ways, instead of telling them to unlearn the lessons of the past, why can’t we just comfort them through the little time they are left with?